It’s the best day of the week— CFC Match Day! If you’re new to the Chattahooligan experience, here’s a rundown of basic information. The Chattanooga FC season pass is the best entertainment value in the city. Passes grant entry to all home matches in the 2019 campaign, including nonconference, playoff, and NPSL Fouders Cup matches. Learn about the CFC season pass wristband or jersey at the CFC Shop. Tickets can be purchased at the Finley Stadium box office on match day beginning 2 hours before kickoff, on the CFC website, or at Winder Binder located at 40 Frazier Ave.
All seats are General Admission, and all tickets are valid in the Chattahooligans Supporters Section, section 109. Free admission for fans 6 and under and youth wearing a current CFC Academy jersey. Parking is available on site at Finley Stadium. Check the Finley Stadium website for more information. The club may offer parking passes for 2019. Weekend and holiday match days begin with tailgates that start 4 hours before kickoff. Detailed information can be found on the Events page. Workday matches are preceded by a meetup at Chattanooga Brewing Company starting at 5pm. Chattahooligan pregame is an ideal setting to meet other supporters, and the tailgate merch table is the only spot to acquire Chattahooligan apparel and accessories—you’ll look super fly, and your purchase supports our grocery bill and operations. The most sacred of supporter traditions begins 30 minutes before kickoff—the March to the Match. 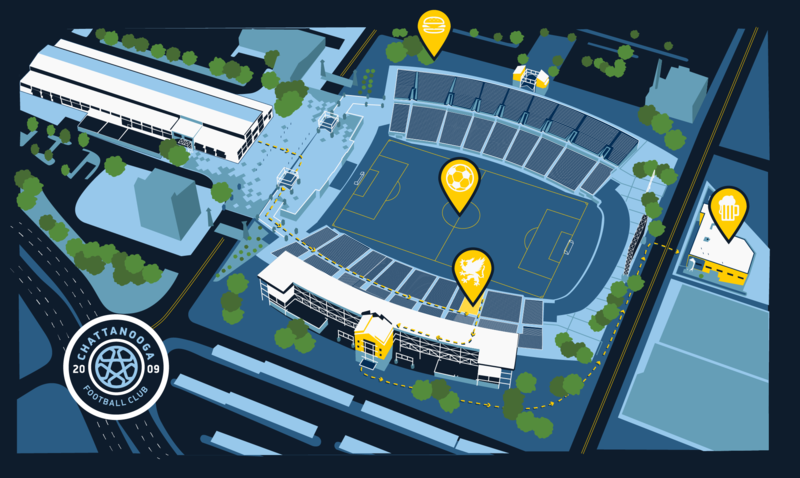 Gather in the southwest corner of the Finley Stadium north lot for special announcements, pregame hype speech, and procession into the stadium. The march is followed by “choir practice” to learn new songs and chants upon arrival in the Chattahooligan Supporters Section. Come and Join Us isn’t just a chant. It’s an invitation to 90 thrilling minutes with The Chattahooligans, followed by a lifetime of new friends as part of the greatest community Chattanooga has to offer. All are welcome. We want you standing with us. After the final whistle, fans can meet the players on the field, then head to Chattanooga Brewing Company for post match celebration. Please never drink and drive. For those fans who wish to partake in drinking alcohol on match day, please be prepared to show an ID at the Chattahooligan merch table to obtain a wristband. If you wish to purchase alcohol within Finley Stadium, you will have to obtain a different wristband from Finley staff. Finley Stadium also has safety and security policies listed on their website. The Chattahooligans have an exception for council-approved banners, flags, and noisemakers in the supporters section.